Metal Buildings | D.R. 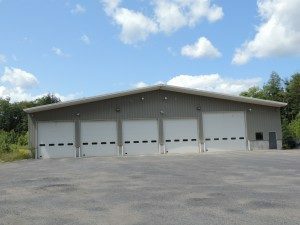 Poulin Construction, Inc.
Metal buildings are a durable, cost-effective building solution for businesses and organizations looking for a way to reduce the amount of time and expense it takes to construct a high-quality building. If you’re considering metal buildings for your operation, the area’s leading metal building contractor is D.R. Poulin. As an experienced metal building contractor, D.R. Poulin is the only construction company for metal buildings authorized to sell and install Kirby Building Systems, the leader in custom pre-engineered, high-quality and cost-effective metal building systems. In fact, Kirby is recognized as one of the top ten metal building manufacturers in the world. What makes Kirby Building Systems metal buildings so attractive is that they’re complete building systems that include the frame, wall and roof panels, and even a variety of bay options for a wide range of commercial and industrial uses. As an expert in metal buildings, D.R. Poulin can help reduce the cost of time-consuming, traditional, custom-built construction. Metal buildings can be easily combined with wood, brick, glass, stone masonry and other materials to customize the interior and exterior, creating a unique, cost-efficient building to fit your specific needs and give you a unique look without a “cookie cutter” appearance. Even though your metal building is constructed from a complete system manufactured off-site, it is still built with as much care and consideration as a custom, designed-from-the-ground-up traditional building. All D.R. Poulin supervisors are OSHA-certified professionals. The company utilizes state-of-the-art computer-aided-design technology for its metal buildings for greater New England to provide clients with accurate, durable metal building plans and highly-realistic renderings. This makes it easy to visualize exactly what the metal buildings are going to look like. To learn more about metal buildings and get an estimate, contact the metal buildings specialists at D.R. Poulin Construction Company today.